Glover, Samuel Stillman; Pension File No. 28715, Civil War Pension File, (Washington, D.C.: U.S. National Archives and Records Administration), p17 . Glover, Samuel Stillman; Pension File No. 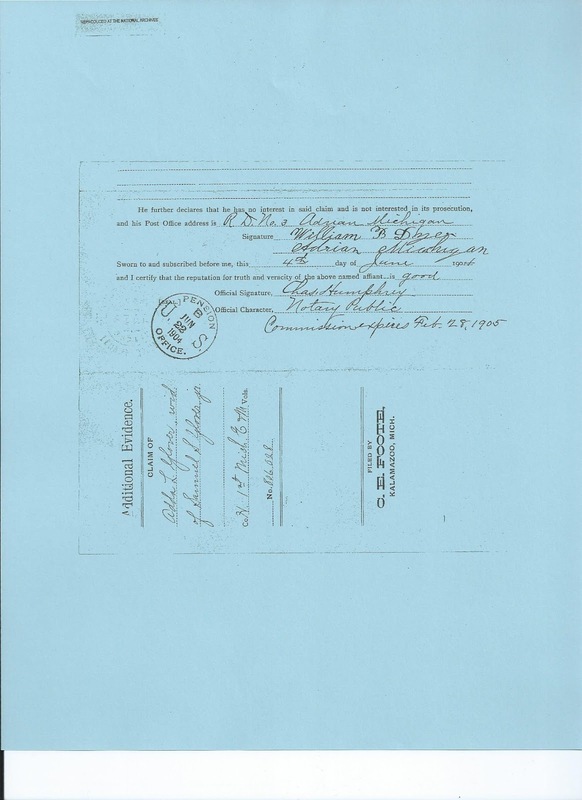 28715, Civil War Pension File, (Washington, D.C.: U.S. National Archives and Records Administration), p18 . My second great grandfather, Samuel Stillman Glover, Jr.'s civil war pension file has been a treasure trove of information. In addition to chronicling his service and injury, there are affidavits from friends, neighbors, and family members. 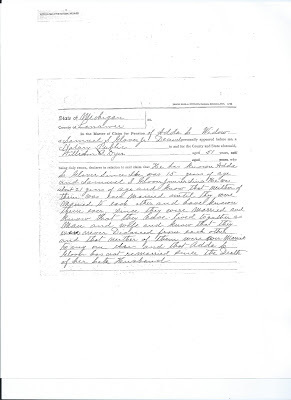 The two page affidavit above was given by William B. Dyer. William B. Dyer is the brother of Samuel's wife, Adda or Adaline L. Glover. William personally appeared before the notary public and stated that "he has known Adda L. Glover Since She was 15 years of age and Samuel S Glover, Junior since He was about 21 years of age and know that neither of them was ever married until they were married to each other and have known them ever since they were married and know that they have lived together as man and wife and know that they were never Divorced from each other and that neither of them were ever married to any one else and that Adda L Glover has not remarried since the Death of her late Husband." William B. Dyer signed it 4th of June 1904 and gives his address as R.D. No. 3, Adrian, Michigan. How does this information help me in my research? The affidavit at first glance may not seem like much, but when it is put together with other information in the pension file and other research I have done, it corroborates a few things. It tells me that Samuel Stillman Glover Jr. only married one woman, so I don't have to look for other marriages. It tells me that as of 1904, Adda Glover had not remarried. Although, the affidavit doesn't state a relationship between Adda and William B., I know from other research that Adda had a brother, William B. William B. Dyer was 14 years younger than Adda. I am guessing the he chose knowing her since she was 15 years old, because he wouldn't really have known her as an infant. He has known Samuel S. Glover since Samuel was 21, since about 1857, which other research showed that was the year Samuel and Adda were married. 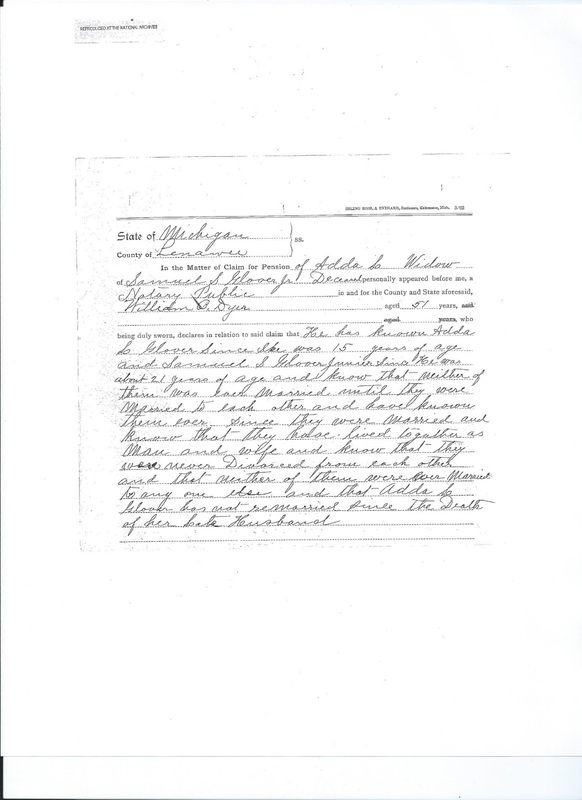 It puts William B. Dyer in Adrian, Michigan on 4th of June, 1904. It gives me a place to look for further Dyer research. William B. and Adda L. Dyer's parents, William G. and Mary Ann Dyer need further research and Adrian is one place to start looking.